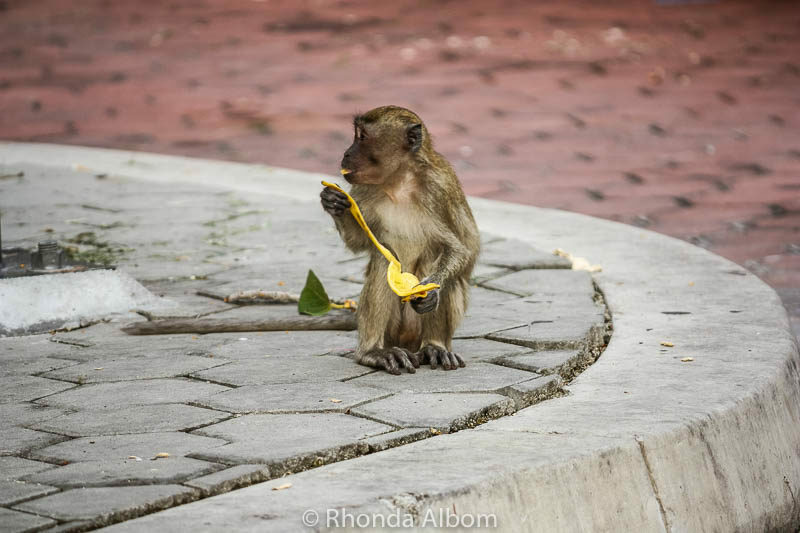 As we stepped out of the car at Batu Caves, monkeys were the first thing to catch my eye. 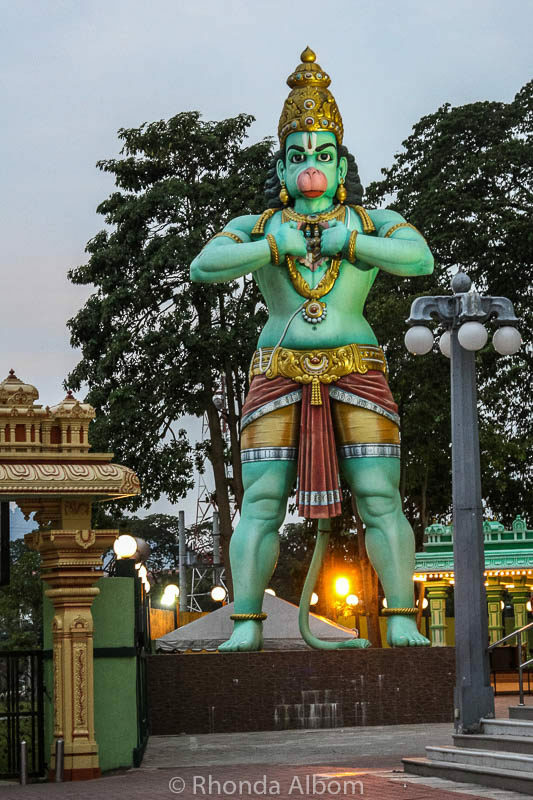 Just beyond a troop of long-tailed macaques (wild monkeys) stood the largest Batu Cave statue, the 43-metre tall golden figure of Lord Murugan. 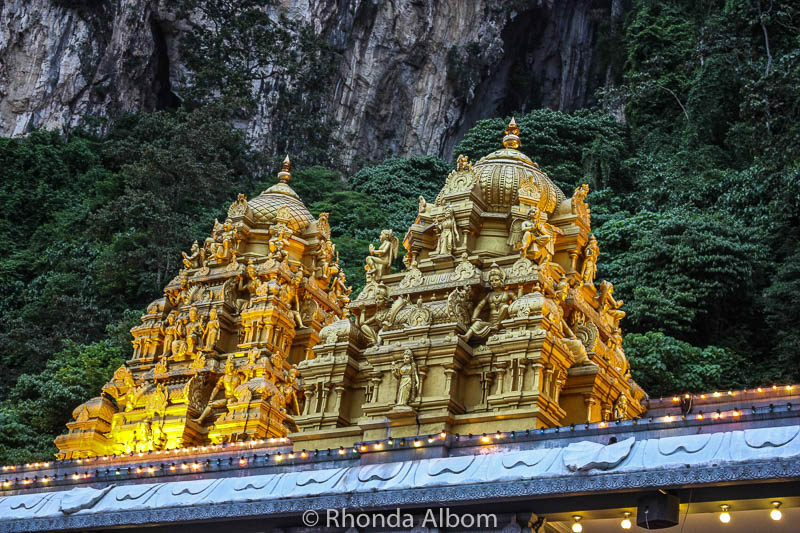 Behind Lord Murugan are the Batu Caves steps leading to this Malaysian temple. In total, there are 272 steps, each taunting us to climb them. 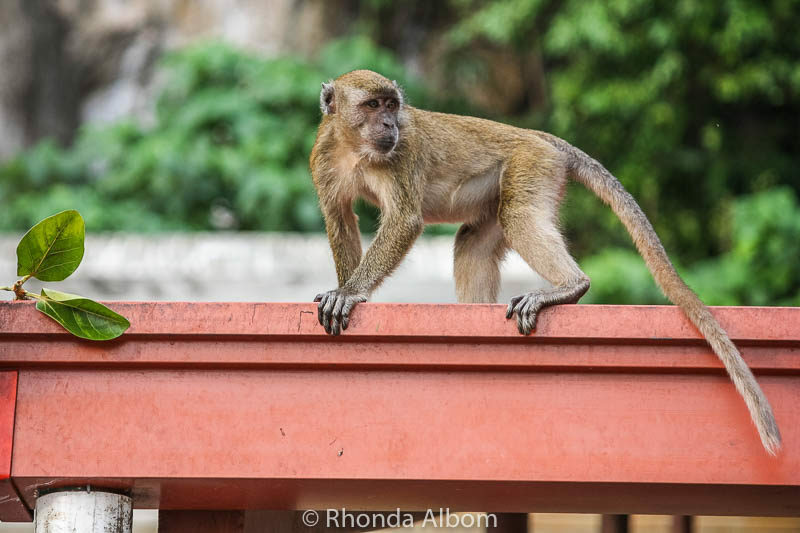 These long-tailed macaques, often referred to as Batu Caves monkeys, are a frequent sight at this Malaysia temple. 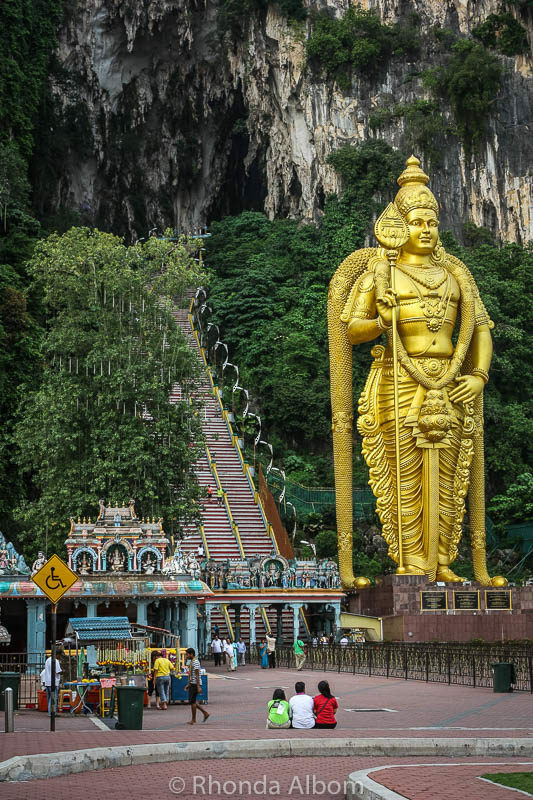 Installed in 2006, the 42.7m tall Batu Caves Murugan statue is said to be the largest in the world. It stands in front of the 272 steps that lead to the cave entrance. Once at the top, we enter Cathedral Cave, one of three main limestone caves featuring temples and Hindu shrines. Here, we find high ceilings with holes that illuminate the space, and several shrines and other Hindu areas. It’s beautiful and instantly worth the climb to get here. For us, walking around and taking photos was perfect. However, abseiling, spelunking, and rock climbing Batu Caves are all popular amongst the adrenaline junkie crowd. There are more than 160 climbing routes up the limestone hills. Most trails start from the northeast side of the cave complex, while the staircase we climbed faces south. A Malaysian monkey at Batu Caves. Our guide Ben talking to Sarah gives a bit of perspective to the giant Batu Caves. Earlier, we had debated whether or not to visit, as we had heard such mixed reviews of Batu Caves as a tourist destination. Some told us it was too crowded, while others went as far as calling it a tourist trap, a name that made no sense to me, as the main Temple Cave is free to enter. However, we didn’t want to miss out on seeing one of the most popular series of Hindu temples and shrines outside of India. We were glad we opted for a private Batu Caves tour guide and found the added information he provided to be fascinating. However, plenty of people visit on their own. This larger than life statue of Hunaman, the Monkey God is located outside of the cave temple. A very brief Batu Caves history: It was discovered in 1878 by American naturalist William Hornaday, although it had been known previously to the indigenous people. Hindu pilgrims have travelled here for more than 120 years. 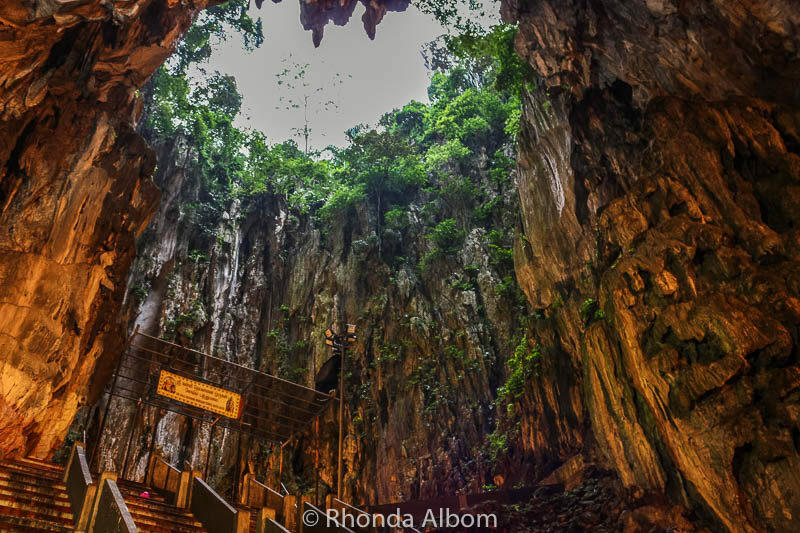 The caves are the focal point of the Hindu festival of Thaipusam in Malaysia. Durian fruit was one of the many things for sale in the area of the caves. It smells worse than the caves. 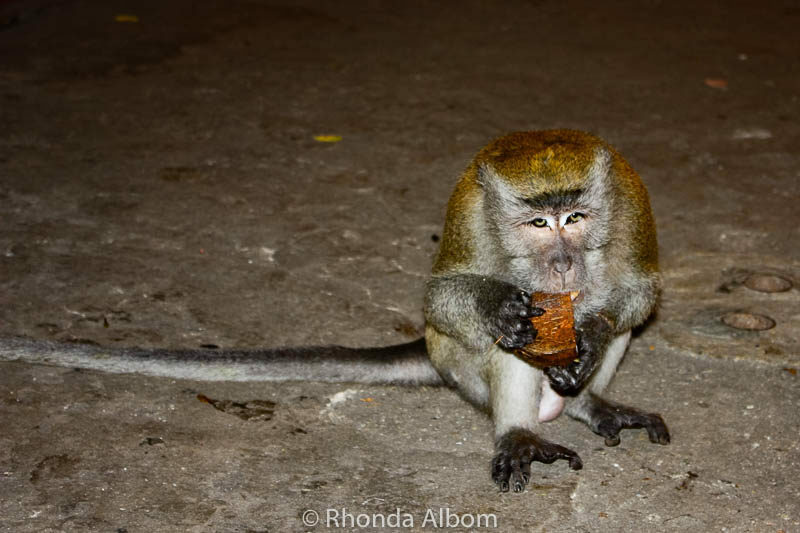 Adorable as they are, it’s important to remember that the Batu Caves monkeys are wild animals. While they are accustomed to having humans nearby, they are not domesticated, and therefore should not be touched. They have been known to bite, scratch, or steal from visitors. 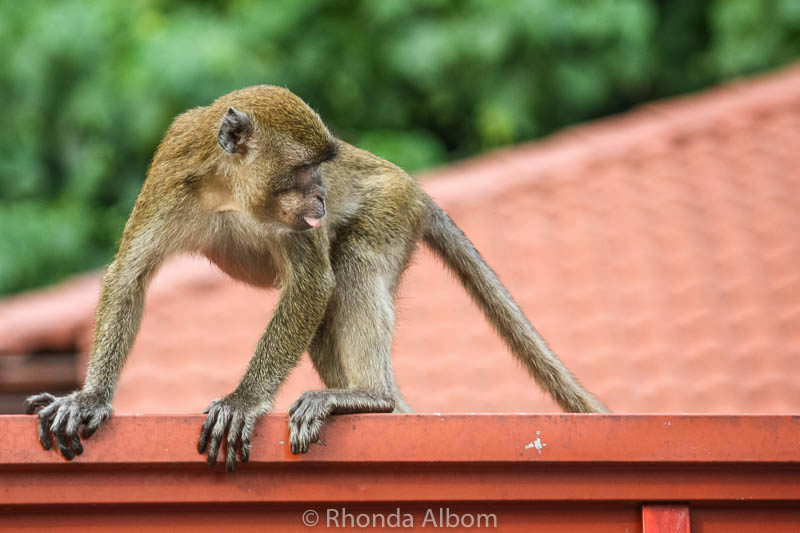 If you are going to ignore this advice (or even if you are not), I would be sure I was carrying comprehensive medical insurance, as infection from Batu Caves Monkey bites is not uncommon. We use World Nomads, as they are full travel insurance in addition to medical. And importantly, they are one of the few companies that allow you to purchase insurance after your travel has started (although you would need the insurance in place before any incidences occur). This was our first exposure to wild monkeys. These long-tailed macaques are very different from the tailless Barbary macaques we saw scampering in Morocco. Taking any wild animal photos should always be done at a safe distance, even at Batu Caves. Food should not be brought to the area, as its smell will encourage the monkeys. Prayers are held at 8.30am and 4.30pm daily. 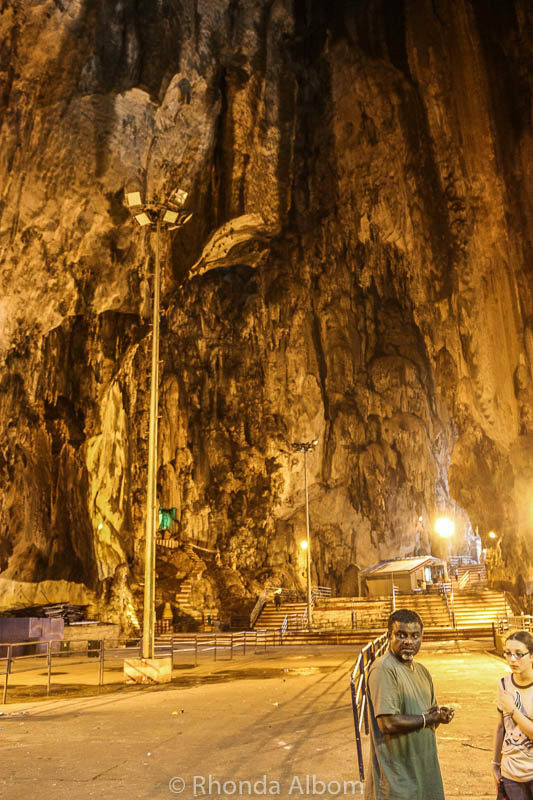 There is a different Batu Caves entrance fee in different areas, but entry to the main Cathedral Cave is free. There is a nominal charge for the car park. The dress code does not permit short pants or skirts above the knees. If you are not familiar with the hose in Malaysian style facilities, you might want to bring your own toilet paper. We chose to stay at the luxurious Federal Hotel in Kuala Lumpur. It was walking distance to many things we wanted to do, had a nice pool, and was clean and well presented. The concierge service was top notch and the dim sum meal we had was outstanding. There are accommodation options closer to the caves, but we found the Federal really met all our needs. Batu Caves are in Gombak, Selangor, Malaysia. It is just 13km to the north from Kuala Lumpur to Batu Caves. It is easy to get there on the KTM commuter train, on the bus, on the monorail (and then a bus), or with a private vehicle. Don’t know, for me, even after almost 2 years in Asia, and some 6 months in Malaysia, Batu Caves still seems like kinda interesting place for KL. It’s very different from other sights in the city, and I really like Indian food you can get in the nearby restaurants. KL was our second city in South East Asia, so we were still excited by the little things, so we quite enjoyed it. We found it interesting. I wonder if we would view it differently if we went today, as we visited during the first week our around the world adventure, and our first week in Asia. Monkeys seem to weigh in with their ubiquitous presence in most places of South-East Asia. You seem to find them everywhere in hordes. Especially in tourist places where they have avenues for getting food. But may times they are of nuisance value as they have the capability to disrupt things. The statue of Lord Muruga looks magnificent. It is a pity that the surroundings are not up to the mark and the odour around the caves is overpowering. I think the odour goes along with the monkeys, it is part of them being a nuisance. We are careful not to have any food on us when we visit sites with monkeys. So far the worst we have encountered was a monkey jumping up and biting the end of our towel on a rainy day in Ubud. 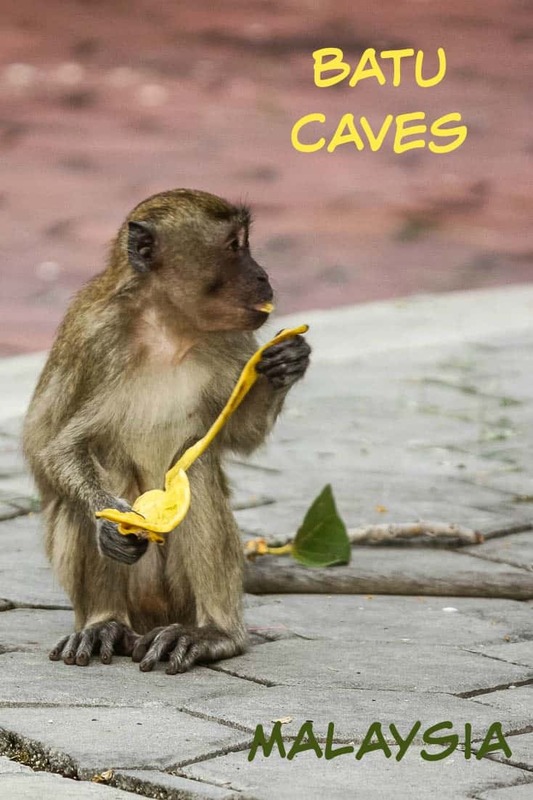 Batu caves look worth visiting from your photos, and monkeys are a part of the experience! Thanks for this detailed guide including the practical information and tips. I would be visiting Malaysia soon and I think I’ll visit this now! We didn’t spend anywhere enough time in Malaysia. I really need to go back. I always see this big statue on the website, and I was wondering how wonderful it is to pay there a visit. Thanks for affirming my belief! It’s a mix of the good and bad, but the statue is a must see for yourself type of site. Those monkeys are wicked. That 43m gold statue! Wow, its huge! Must have been such a great place to visit! LOL – wicked is a perfect description, and yes the statue is impressive. I was shocked about the monkeys when I went there last year. I don’t know why I was expecting them to be like the rather docile monkeys I saw at the Awajishima Monkey Center in Japan – http://www.trekkingwithbecky.com/awajishima-monkey-center/ – but they were much more active and aggressive, although not as much as the monkeys on Monkey Island in Vietnam. Thanks Becky. I love my Olympus. LOL – I know I am not the only person who likes it. These caves look very impressive. I have never seen any wild monkeys in their own habitat. The look really cute, but I know they are very naughty and can become quite bothersome. I think it’s time we start visiting Asia. I agree, it’s time to head to Asia. But it is also time for me to explore your home country. 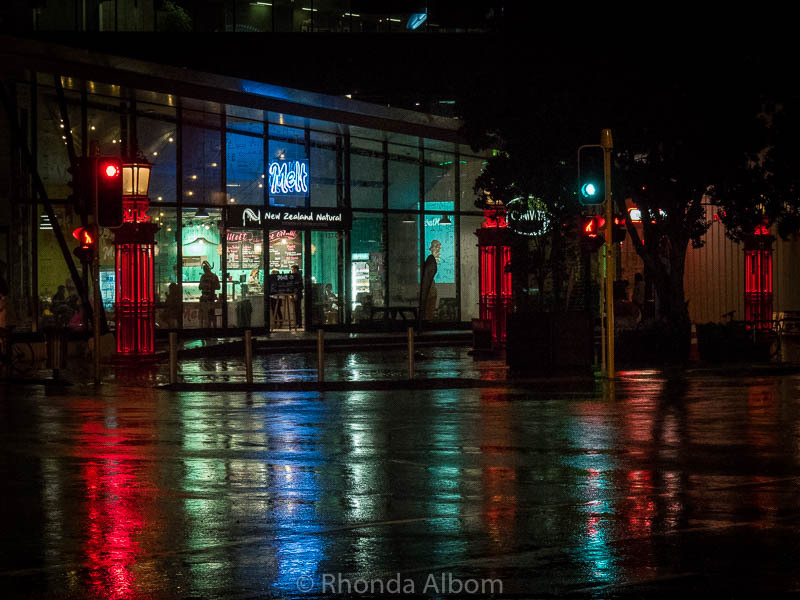 Beautiful place indeed, Rhonda. I have sooo many wild monkeys in Bali :)..some of them are naughty indeed! The monkeys we saw in Ubud, Bali were adorable. Much cuter than these, but I didn’t touch those either. I wouldn’t touch these monkeys. I am a big believer in leaving wild animals alone. You certainly are brave to ignore the smell and press on. Thank you for posting these interesting photographs. I will probably never get a chance to go there. You are an adventurer extraordinaire. LOL – once I was there I really had little choice. Besides, I can get past most smells. Some of them weren’t so cute, with injuries and wounds. I looked for the cutest ones. And don’t let cute trick you. They are wild animals. It looks like an amazing place. Very jealous of your adventure! No need to be jealous, come along as an arm chair traveler. Rhonda, I don’t know if I’ve seen these kinds of monkeys before. All I can say is I’ve seen monkeys in a zoo and I have no clue what kind they are. Oh, I’m glad y’all went ahead to explore the cave – very cool! As open as that appears I’d still be a big scaredy Cathy to go in it. I don’t like the idea of being underground. Those monkeys must follow you like a lost puppy or something, huh? The monkeys are everywhere and so are the people. Some tourists feed them, and they got a lot of unwanted attention, sometimes scratched, or worse, plus the monkeys steal things. I wasn’t afraid of the cave, just intimidated by the stairs. What an experience! I’d love to try the Durian fruit. WOW the statues are cool! Nope I haven’t seen wild monkeys; just ones in the zoo. I liked the durian fruit, but that puts me in a minority of people who didn’t grow up with it. We often visit caves here but I’ve never seen caves that are the object of religious devotion. I had never seen it before either. It was really interesting. I love the giant statues of the gods and the little palaces. Such impressive attention to detail. Considering the smell, I’m glad I have your pics to admire and don’t have to go there to see them! LOL – it was a rather unpleasant odour, but worth it, both for the temples and the monkeys. I was gonna say you really write well and so engaging, then I noticed your affiliation.. this is an inspiration. thank you.. It was definitely worth it. And thanks for the compliments. Your adventures are always great fun! Now here is a place I would love to visit. I know I never will, but I would surely love to explore all the wonders. Holy cow, what great shots and what a beautiful place to visit. You go to some of the best places. Thanks Patrick, we love exploring interesting places. Hi! Very fantastic photos. The statues are very different from our’s. Thanks for sharing. Those statues are very different from any in New Zealand (where I live) as well. Monkeys and bad smells would stop me but especially the steps. I would never be able to walk the steps. Maybe if they had an elevator or escalator, I might check the caves out. India doesn’t excite me at all. 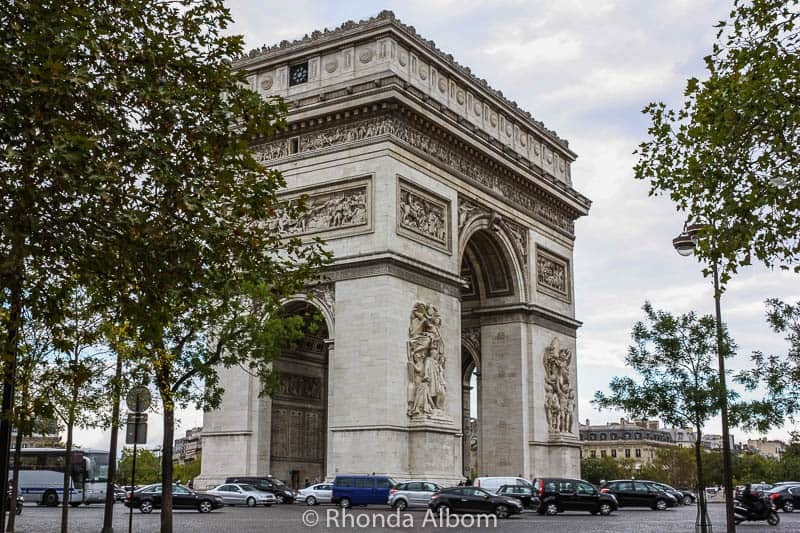 Was it a tourist trap? Have a wonderful day Rhonda. See ya. The stairs are part of the experience, and so are the monkeys. Love your travels and experiences! Anytime you can go into a cave it’s worth it to me. I wouldn’t go near the durian fruit though. LOL – I enjoyed the durian fruit, once I got past the smell. Your daughters’ are excellent photograhers! The cave looks amazing and you’re getting lots of exercise with all those steps! Glad you’re having fun, and I know you’ll enjoy China! I remember those steps well and the inside of the caves is an unexpected surprise. I’m glad this is turning out better than you had thought it would.